There would hardly be anyone who hasn’t heard of the poetry of one of the most renowned poets of all times, Mirza Ghalib. Ghalib held Delhi very close to his heart since it was his birthplace. This revered poet passed away in the year 1869 but did not have a grave of his own for 100 years. 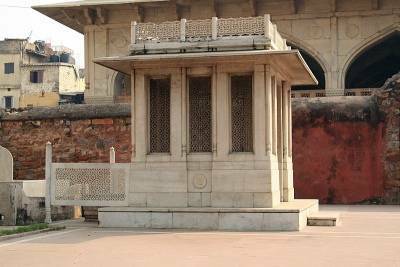 It was only a century later that a tomb was constructed in Delhi to house Mirza Asadullah Khan Ghalib’s grave. Tomb of Mirza Ghalib complex covers an area of 3,500 sq ft and lies in the vicinity of the sacred shrine of Hazrat Nizamuddin, within a densely populated 14th century Delhi village. The courtyard is surfaced with red sandstone, white marble and decorative patterns. It is also speckled with a number of other graves said to be of Mirza Ghalib’s family. Right next to the tomb is located the famous Ghalib Academy, full of Ghalib’s work in Urdu along with other paintings, literature and notable collectibles. Though not very grand in its location and architecture, the tomb attracts thousands of devotees. People come and pray at his grave, visit the Ghalib academy and praise his work. It is a place of worship for all those who admire the sacredness of Ghalib’s verses that are full of love and compassion.